Being Held Up Is Obviously A Sheila Thing And Praise For Glory's Turn Out! Hold up tactics were again used on Its A Sheila Thing at Brighton this afternoon. Under Charles Bishop she pulled a little early on as he tried to settle her at the back. She came on the outside of the field three furlongs from home in the mile race and was soon battling it out with the leaders, finally finishing third beaten half a length and a neck. A small drop in the weights should help her chances of victory. In the next race Alex won £25 for his first unaided "Best Turned Out" with Praise N Glory. A visit to the geldings (Hab Sab, Itoldyou, Mab Dab and Due South) in their holiday paddock showed them to be happy, chilling out in the fine weather. With plenty of good grass they should be in a great state of health when they return, probably sometime in July. 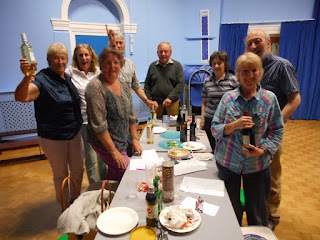 It's not just races that Valence Racing win, they put together a quiz team and it gained victory by the narrowest of margins (a half point) at a local school quiz night.